The Contra Costa Transportation Authority identifies the key problems in the transportations sector as: Congestion, increase of single-occupant vehicles, greenhouse gas emissions, and infrastructure risks such as rising tides. Nearly 92% of all trips are by car. Over the past 30 years, traffic congestion has increased at a faster rate than population growth. Congestion is expected to continue to increase with average vehicle delay more than doubling. Transportation is responsible for approximately 40 % of greenhouse gas emissions in California. The transportation system is also vulnerable to effects of climate change, especially rising tides. SB 32 mandates a 40 percent reduction in GHG emissions below the 1990 level by 2030, and the Governor’s Executive Order B-16-2012, aims to reduce transportation GHG emissions to 80 % below 1990 levels by 2050. In order to comply; counties and cities need to address emissions caused by the transportation sector. Cleaner cars and alternative transportation improves the health and safety of residents. Traffic collisions are the leading cause of death in the U.S for people under the age of 34. Every hour spent in a car increases a person’s risk of being obese by 6%. 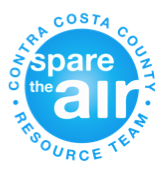 Air quality and noise levels are increased in communities close to highways– large areas of San Pablo, Concord, and Antioch are impacted. The Contra Costa Transportation Authority manages the county’s transportation sales tax program and planning. The Metropolitan Transportation Commission is a transportation planning, financing and coordinating agency for the nine county San Francisco Bay Area. Contra Costa County – partnered with Scoop, a carpooling application, to increase the number of carpoolers and decrease single occupant vehicles. City of Richmond conducted a First Mile/Last Mile Strategic Plan, using a sustainability grant from CalTrans. City of Pleasant Hill Bart remodel combines housing, work, transit, and entertainment in an urban space. The Contra Costa Centre also offers employees commuter benefits for alternative transportation. City of Dublin BART partnered with MTC and Scoop to guarantee parking at Dublin BART to carpoolers. City of San Jose Green Trips challenge + Green Commute Champions. City of Palo Alto implemented a free downtown shuttle running seven days a week for easy transit access. City of San Francisco partnered with Waze to help alleviate congestion in San Francisco, working in coordination with the Mayor’s Rush Hour Congestion Strategy). Marin County partnered with Lyft to provide credit for the Lyft line carpool – Commuters on the SMART train will be able to get discounted rides between the rail station and work through a subsidy for the Lyft service. TransForm’s GreenTRIP program has completed greenhouse gas emissions reduction evaluations for many housing projects applying for Affordable Housing and Sustainable Communities (AHSC) funds. They also provide GreenTrip Certification for new housing developments. Caltrans’ Division of Rail and Mass Transportation (DRMT) website. Metropolitan planning organizations such as the Metropolitan Transportation Commission have their own active transportation programs here. The Road Repair and Accountability Act of 2017, or SB-1 discretionary grants and information can be located here. A call for applications is expected to be released in the coming months, or early next calendar year depending on the specific program. Federal discretionary grants can be found here.